1 quick-action chuck 1/8 - 5/8 in dia. 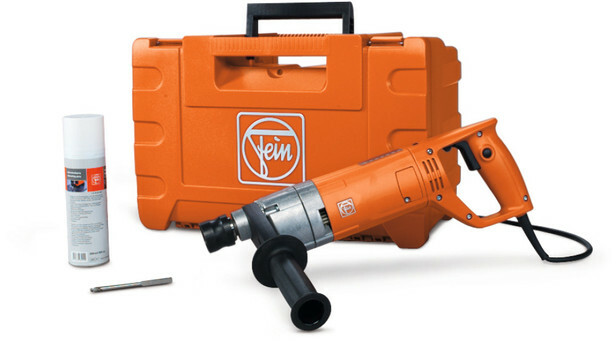 The FEIN KBH 25-2 U is the only hand-guided metal core drilling system. The perfect interaction of powerful handheld drill, optimum speed, patented drilling technology and carbide core drill bits with special cutting geometry guarantees that you can save huge amounts of time and money. 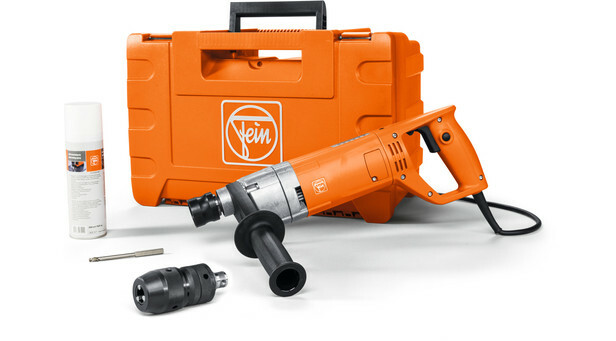 A result of long experience and the enormous development edge that FEIN has as inventor of the power drill. The world’s first hand-held core drilling system for metal, the FEIN KBH 25, impresses with perfect drilling results. Use of machine components with high mechanical stability and the distortion-free barrel design provide maximum precision. The new carbide core bits are optimized for long service life, and impress with high quality carbide teeth that withstand shock and impact loads. Hand-held boring of holes up to 1 in (25 mm) diameter in steel up to 3/4 in (19mm) thick using carbide core bits. A boring system with the highest quality materials and workmanship, combined with carbide core bits optimized for long service life.